Lo, it is Lent, and in this time of abstinence we address the spirit of plenty. I have long felt that in the spirit of Urfaust there is a very genuine embracing of experiential spiritualism, albeit a routeway towards seeking the divine that is strewn with bottles rather than prayers. Yet in a sense their legendary reliance on alcohol as an initiator of inspiration is in itself an act of mortification, decaying the body so that the spirit might grow and elevate. An abstinence of sobriety, a devotion that itself borders on the religious to the alcoholic experience, which sees the band utilising the metaphor of the hermit and vagrant to such great effect. Indeed, the rejection of the typical stock black metal vocals in favour of IX’s quasi operatic cries creates an atmosphere of entreaty, supplication and delirium that hints at the visionary process, either in the form of the soaked tramp who sees all manner of supernatural beings due to his blood alcohol levels, or the genuinely mystical experience of transcending one’s own being through altered states of consciousness. The phrase ‘intoxication ritual’ which is inscribed on all advertised concerts of theirs is no casual coincidence, neither is their own moniker of ‘clochards’; for the band this is genuine communion, albeit with rather more of Christ’s blood than usual. Reflecting upon an album such as Apparitions, despite consisting of only four songs (merely three of which are actually structured), is a tricky task. Sure, Urfaust are known for having a distinctive sound which calls all manner of esoteric elements to mind, but never before have they made something quite so occult in nature. Ironically, this has been done by eschewing almost entirely their ‘metal’ aspect, embracing a lysergic darkened ambient approach, plodding funerary marches and a myriad of frills which give this EP such a Bruegel-esque texture that occasionally it feels as if the listener is in fact sinking into the desperate mire of The Blind leading the Blind. Prior efforts have featured ambient only pieces (Geist ist Teufel, Trauerhöle and In den weiten öden Räumen) and atmospheric flourishes via a moog or string arrangement are never far from Urfaust’s cannon, yet this is first instance where such elements form the core and substance of an album, marking a distinctly new approach to their esoteric soundscapes. Following the theme of religiosity remarked upon above, I believe that the potential links between Urfaust, Bosch and Bruegel (Pieter the Elder) can be played out with particular effect with regard to Apparitions. Following Hieronymous & Pieter, IX and VRDRBR marry both the grotesque and the spiritual within their art, and the debased icon-esque cover art heightens this link, emphasising the religiosity which this due find in intoxication; spirit via the excesses of the Land of Cockaigne. Ritualistic to an uncanny degree, the opening piece (“The End of Genetic Circles”) lights the candles and sets the stage in a dreamy, hazed and intoxicated fashion – rather like those moments of perceived inspiration or revelation one suffers at 2am, pissed beyond belief, drifting into deeper reveries. Here we can find the mystic, or magus, working or dying in caverns beneath Medieval Ghent. Similarities can be drawn between this piece and Velvet Cacoon’s ambient opus Atropine, whose unearthly drones and quavering tones invoke a similarly detached, mysterious and drugged mood in the listener. 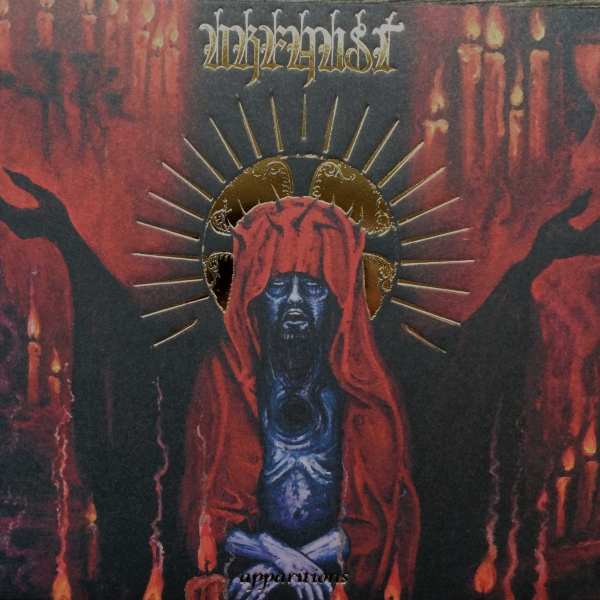 The key here is that Urfaust never loses sight of its (paradoxically) monastic flavour; the constant pursuit of communion with the beyond courses through the music like blood, cut with a hefty dose of spirit. “Apparitions” emerges out of this aether with a muddy stringed march arrangement, a wordless melody tumbling over the graveyard pace, joined by a drunken muted cittern that stutters alongside. Stumbling, despairing, this song is the hermit or vagrant of the album, sinking further into oblivion via some hefty triple malted beer, and (on purpose or not) contains what might be the one of the most Medieval characters to be encountered. The entreaty in the voice, the pleading element of the lyricless song is one which recalls the paranoia and desire for salvation so omnipresent in multiple monastic writings of the period, aided of course by that damned cittern. Bosch’s triptych Hermit Saints is a fine companion, the dreary landscapes, miniature demons, prayers and solitude present in this painting echoing the aural motifs of “Apparitions”. The next character in this tableau to emerge is “The Healer”, also providing the only discernible presence of the guitar-based Urfaust we have become familiar with. A dirge rhythm, an incantation proceeding from IX which may or may not be an invocation, here we have some manner of supplicant in temple surroundings. This is a highly ceremonial piece, although differently to the first track, whose ritual atmosphere drifted organically, instead there is an innate structure, as if following a narrative or instructed behaviour. Bruegel’s The Blind Leading the Blind follows this turgid pace, one foot before another through the mud, destined to fall yet hoping for charity and relief, the church far in the distance where healing may be possible. The rolling pace also brings to mind motion sickness, which appropriately precedes the enormous closer, aptly named “The River”. Stygian and immense, the waters of this piece ooze along with Gangetic desolation, turgid and wordless. At twenty two minutes, this might be a slightly overblown experience, and whilst the eerie mutterings and groans are effective for the first ten minutes, the experience beyond feels moderately stretched out. As an approximation of the deathly flow beneath our feet however, it is well crafted, and allows the album to sink out into oblivion in a suitable mysterious manner. The parallels between this and Bruegel’s Triumph of Death are obvious, right down to the clanging of metal, screams of the damned, the brimstone and processions of misery which fill both the aural and visual panels. Apparently recorded within a single (no doubt intoxicated) night, Apparitions may not be to everyone’s taste, lacking as it does the metallic crunch of the band’s previous outings. However to my mind this is the distillation of Urfaust’s sound in its purest form; muddy, hazy, drugged/drunken and vintage, with one foot on the earth and the other in some ether-soaked reverie of despair and revelation. Make sure to stock up on Draak though prior to listening, it would be a shame not to enter into the spirit of things.